SEOUL/TOKYO -- The South Korean government urged Japan on Thursday to refrain from "overreacting" to Seoul court rulings against a Japanese firm for wartime forced labor. "It's very regrettable that the Japanese government is continuing to respond excessively to our judiciary's ruling, and (we) call for its restraint," the foreign ministry's spokesman, Noh Kyu-duk, said at a press briefing. He said it's natural for an administration to respect a court decision in a democracy. The ministry called in Japan's ambassador to Seoul, Yasumasa Nagamine, to deliver a direct protest message. The ambassador did not answer a reporter's question while entering the ministry building in Seoul. 1944 with no pay and a bereaved family member of another on two separate suits. The court upheld two appellate court judgments -- one that ordered Mitsubishi to disburse 100-120 million won ($89,000-109,000) to each of four female victims, and the relative, and the other that ordered it to pay 80 million won each to six elderly men. In Tokyo, Japanese Foreign Minister Taro Kono immediately described the verdicts as "very regrettable and unacceptable." He argued that they run counter to the 1965 pact between the governments of the neighboring countries on normalizing bilateral diplomatic ties. He said all reparation issues related to Japan's 1910-45 colonial rule of Korea were settled through the accord. Kono said the rulings would incur "unjust disadvantages" to the Japanese company and uproot the legal foundation of friendly, cooperative relations between the two nations. He characterized them as a violation of international law and pressed Seoul to take appropriate measures to address the problem. Otherwise, he warned, Japan will consider "every option," including an international lawsuit. Chief Cabinet Secretary Yoshihide Suga also told reporters that Japan has "various specific" countermeasures in hand. He would not elaborate. Japan's Vice Foreign Minister Takeo Akiba summoned Seoul's Ambassador to Japan Lee Su-hoon to lodge a formal protest. 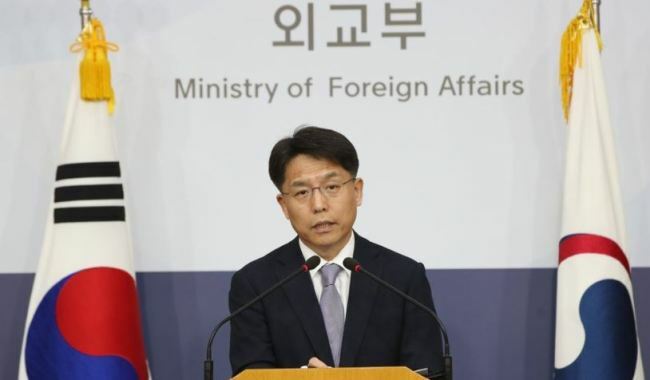 Seoul's foreign ministry, however, said it would honor the rulings with a focus on endeavoring to heal the pain and wounds of World War II-era forced labor victims. "We will draw up ways to deal with the issue in comprehensive consideration of various elements, including the Supreme Court rulings today," Noh said. Separately from the forced labor issue, he stressed, South Korea will keep trying to develop relations with Japan in a "forward-looking" manner. The court decision was widely expected, echoing its verdict against Japan's Nippon Steel & Sumitomo Metal Corp. a month earlier for its similar wartime atrocity against Koreans. It made clear that victims have their own rights to compensation despite the state-to-state agreement and the statute of limitations has not expired in relevant cases. Thursday's rulings usher in the worsening of already frosty bilateral relations, despite Seoul's policy of separating regional security cooperation with Tokyo and historical issues. The Moon Jae-in administration is considering the establishment of a government-civilian consultative body to handle the legal matter and cope with troubles in diplomatic ties with Japan. Last week, the Moon Jae-in administration announced a decision to disband a Tokyo-funded foundation on Korean women forced into sexual slavery by Japanese troops during the war.